Dr. Desai then addressed the large vasodilatation/vascular component of melasma. Although the predominant feature of melasma is the hyperpigmented patch, a pink hue becomes apparent after treatment of the brown pigment. Historically, the redness was thought to be a side effect of Modified Kligman’s Formula, but more recent research suggests that this due to an inherent expression of vascular markers in melasma lesions. This vascular component can be treated with low fluence pulsed dye laser; oral tranexamic acid has also been helpful in Dr. Desai’s practice. So now onto the treatment of melasma! Given that triple combination cream (TCC) is the gold standard therapy for melasma, it makes sense that Dr. Desai started with a discussion of research on this product. A randomized controlled trial of TCC in Southeast and East Asian patients with melasma found that, after 8 weeks of treatment, *TCC was superior to monotherapy with hydroquinone, although it was associated with more adverse effects. * Dr. Desai has found this to be true in his practice and, therefore, he rarely prescribes hydroquinone alone. The retinoid and steroid in TCC help with desquamation and exhibit anti-inflammatory properties that counter the upregulation of prostaglandins and tyrosinase in melasma. 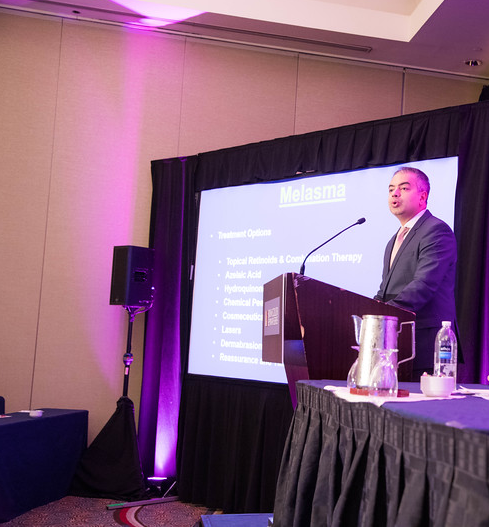 Next, Dr. Desai discussed newer global therapies that show promise for the treatment of melasma. Kojic acid dipalmitate (different molecular ingredient than kojic acid) is a tyrosine inhibitor being used in botanical-based skin care products in India, UK, Saudi Arabia, Japan, etc. It is much more UV- and light-stable than traditional kojic acid, which helps enhance UV protection. A study of kojic acid dipalmitate 0.75% monotherapy in India demonstrated significant improvement in melasma severity at 8 weeks, which was maintained until 12 weeks. Methimazole is a medication taken orally for the treatment of hyperthyroidism and thyrotoxicosis. As a potent peroxidase inhibitor, methimazole blocks a key step in melanogenesis (final packaging steps of melanosomes), which leads to a morphological change in melanocytes. Methimazole has been compounded into a cream base that is odorless, well-tolerated, and non-melanotoxic even at high concentrations. In the United States, the only available form of TXA is brand name Lysteda® 650mg, which is FDA approved for the treatment of cyclic heavy menstrual bleeding. *Dr. Desai tells his patients to cut Lysteda® in half; take half (325mg) in morning and half (325mg) in the evening. *Typically you will see improvement within 8-12 weeks. *If you do not see improvement in 8-12 weeks, then you probably won’t see any effect with TXA.*Dr. Desai will continue TXA as long as patients are improving, but often he tapers down to once daily as maintenance therapy. At this point, there does not appear to be a limit to how long a patient should remain on TXA, although none of his patients have been on it for more than 7 months. Dr. Desai’s final point was that patients often cannot differentiate between “lightness” of the skin and “brightness/tone.” Typically, patients who say they want to be “lighter” will be happy when you improve their texture and tone. 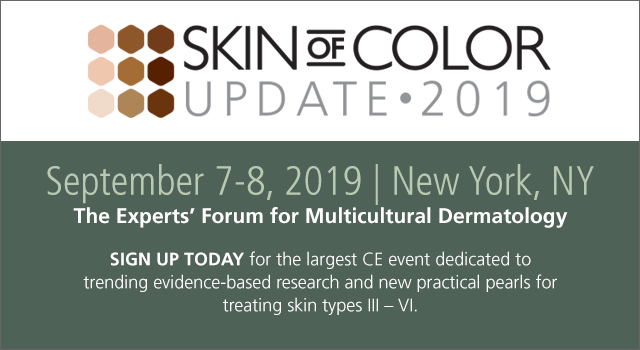 If you want to learn more about skin lightening and how to approach patients who are interested in skin lightening, check out my coverage of the panel discussion “The Skin Lightening Dilemma: A Candid Conversation with the Experts,” which includes the viewpoints of Dr. Desai, Dr. Valerie Callender, and Dr. Eliot Battle. Next PostNext It’s Pop Quiz Friday 8/10! Let’s see if you get it right!